China has denied a request for a U.S. warship to visit Hong Kong, the U.S. consulate in the Chinese city said on Tuesday, amid rising tension between Beijing and Washington over trade and a U.S. decision to sanction the Asian nation's military. 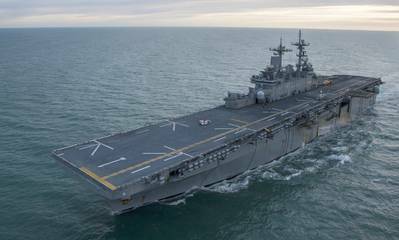 The amphibious assault ship Wasp had been due to make a port call in the former British colony of Hong Kong in October, diplomatic sources said. "The Chinese Government did not approve a request for a U.S. port visit to Hong Kong by the USS Wasp," a consulate spokeswoman said. "We have a long track record of successful port visits to Hong Kong, and we expect that to continue," she added. In Beijing, Foreign Ministry spokesman Geng Shuang did not directly answer a question on whether China had denied the request. "For requests for U.S. military ships to visit Hong Kong, China has always carried out approvals case by case, in accordance with the principle of sovereignty and the detailed situation," he told reporters, without elaborating. In 2016, at a time of heightened tension over its territorial claims in the disputed South China Sea, China denied a request for a U.S. carrier strike group led by the John C. Stennis to visit Hong Kong. On Saturday, China summoned the U.S. ambassador in Beijing and postponed joint military talks in protest against a U.S. decision to sanction a Chinese military agency and its director for buying Russian fighter jets and a surface-to-air missile system. China and the United States are also embroiled in an increasingly bitter trade war.